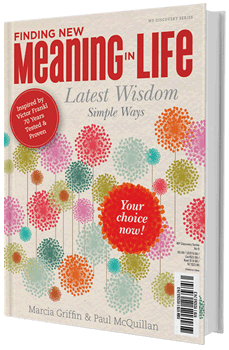 Finding Meaning in Life - Latest Wisdom, Simple Ways. Based on the philosophy of renowned psychiatrist Dr Viktor Frankl (1905-1997) and his groundbreaking bestseller Man’s Search for Meaning, this 160-page book aims to introduce a new generation to Frankl’s belief that all people seek meaning in their lives and suffer without it. “We see our book as a tool that anyone can use to help with their mental fitness and ability to do their best and to have a meaning-filled and exciting life.” Finding New Meaning in Life is a both a self-help book and guide to mental fitness, offering tips and ideas that are accessible to everyone. "Logotherapy is a school of thought in psychology that illustrates the very art of living a satisfying and meaningful life. A book that enhances our understanding of how to find meaning and fulfillment in every area of our lives, as this book indeed does, is to be highly recommended!" Dr Teria ShantallPresident, the Viktor Frankl Institute of Logotherapy, South Africa. "I wholeheartedly endorse your book. I believe the potential readers will not only enjoy reading it but will be enthusiastic in applying it in their lives. Congratulations"
"Leaders from two different worlds. Paul and Marcia click in an enlightening and entertaining dialogue that communicates real life wisdom. While the topics are timeless, the authors' discussion is at once contemporary and approachable. Readers will be taken on a unique journey with a payoff that can last a lifetime." Marshall H. LewisPh.D., Associate Editor, The International Forum for Logotherapy, USA. Marcia Griffin is a woman best described as resilient. Paul McQuillan is a psychologist devoted to helping his clients overcome adversity and find meaning in life. Marcia has succeeded in the face of adversity and transformed her life from school teacher to Corporate Economist to Entrepreneur and Business Woman of the Year. She believes that to live a meaning-filled and exciting life we need to continually evolve and learn. In Marcia’s search for learning and fulfilment, she was introduced to Logotherapy, an empowering and positive form of psychology. Marcia travelled across Australia to meet Dr Paul McQuillan, a Logotherapist and was inspired by his approach.